As many of you know I had blogged yesterday about how I made my sweet littles’ a couple of suitcases to carry all their precious treasures in. Well in all actuality they were shoe boxes wrapped with fabric, I haven’t gotten to the suitcase making phase of my life – yet! Here is what they looked like all clean and neat, I shudder to think what they look like now. 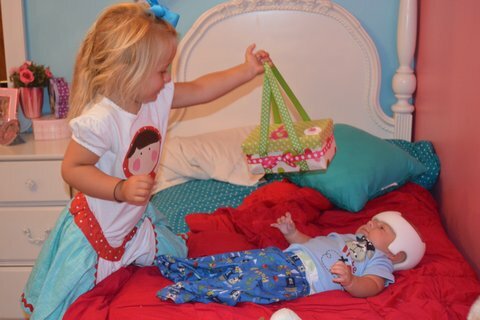 Here is Gianna showing her little brother her box, I imagine he is quite taken in with the box, what 4 month old wouldn’t be? Can anyone guess what they were used for? 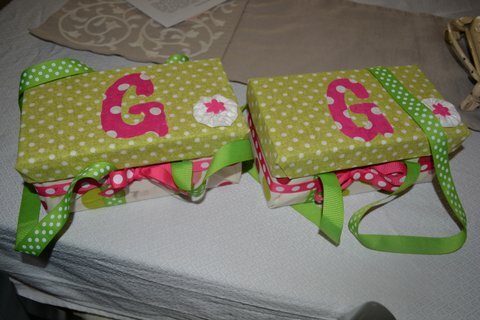 I should do a craft show, make up a ton of these cute little boxes, charge about $10 a box and call them…….. Anybody out there in need of a tomato collector? Remember, never go and pick tomatoes without your trusty Tomato Collector it’s the latest rage! Get one while their hot and not out of stock.